A fully soluble combination of three essential elements; boron, zinc and magnesium, for use especially in pome fruit, but also in grapes and berries, stone fruit, kiwifruit and a full range of other horticultural crops. 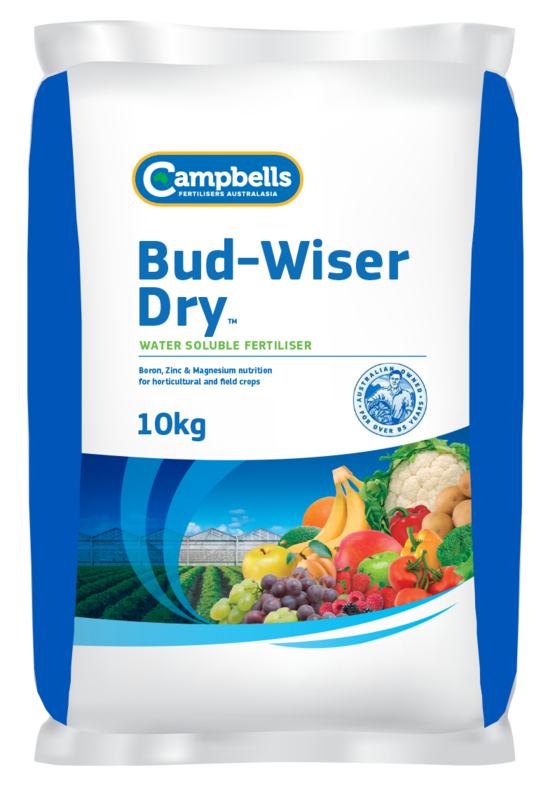 Campbells Bud-Wiser Dry is a flowable powdered product that is fully water soluble and contains three essential nutrients for in-season and post-harvest fertiliser application. Being sulphate based, Bud-Wiser Dry is totally available to the leaf for immediate foliar absorption. Campbells Bud-Wiser Dry is suitable for application via foliar spraying. It dissolves rapidly and completely and remains in solution ready for absorption via leaf surfaces. The specific ratios of nutrients in Bud-Wiser Dry are designed to assist with pre-flowering nutrition, ongoing nutrient demand and post-harvest application. Campbells Bud-Wiser Dry is recommended for foliar application. Recommended rates of application vary between 1.75-3.5 kg/ha – specific rates will depend on the crop, stage of crop development and the nutrient requirement. See the Product Label for comprehensive information on rates and application methods. Foliar applications should be avoided during extremes of climate and during flowering. Before application, seek advice from your Campbells Bud-Wiser Dry distributor or your local agronomist.